The Snake is one of the 12-year cycle of animals appearing in the Chinese zodiac and calendar. And 2013 is the year of the water snake which some astrologers say that people born under this sign are strong, influential, and insightful. 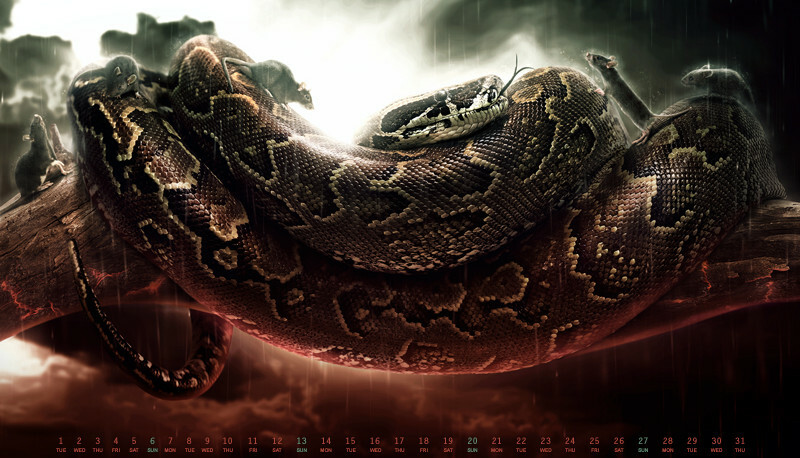 And in keeping up with the Chinese zodiac theme, yours truly have created a “water snake” inspired artwork as You The Designer’s wallpaper calendar for the first month of the year. I call it “Wrath of the Snake” which depicts my own interpretation of “strength” this year has to offer. Whether you are a fan of the Chinese zodiacs or just in search for pure awesomeness, this amazing freebie might just what you’ve been looking for. This wallpaper is available at sizes ranging from 800 x 600 up to 2560 x 1440 – sizes just perfect to customize your favorite gadgets! Get this amazing wallpaper. Just click the button below. Don’t forget to show some love and appreciations on this project on my Behance portfolio. Love our latest wallpaper? Tell us your thoughts and suggestions by commenting below.